Each night after the Salve, we turn and walk in procession toward the altar. Throughout the day we have walked with Christ: we have spoken to Him in prayer, we have spoken of Him to those we have met. We have walked with Mary: we have striven to imitate her total openness to Christ. 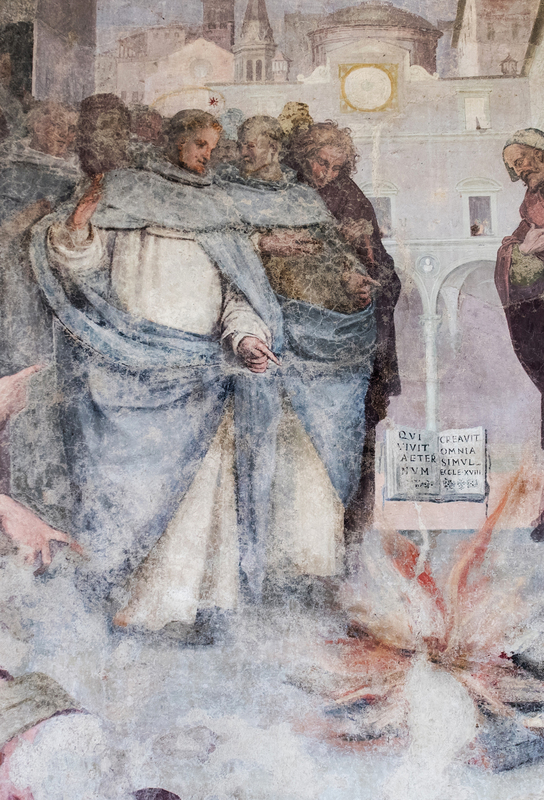 We have walked with St. Dominic: with him we have contemplated Truth, and with him we have given Truth to others. But all this walking is mirrored in our nightly procession: from God, to God, under the protection of Mary, in the footsteps of St. Dominic. And so at the very end of Compline, we sing to the Father of our Order in the traditional Dominican chant of the O Lumen. Not long after St. Dominic’s death, these words were written by Constantine of Orvieto as an antiphon. The antiphon likely began to be recited or sung at the conclusion of Compline after Dominic was canonized. This puts the nightly singing of the O Lumen in an important context: the recognition of Dominic’s heroic holiness. As Dominicans, we are each called to heroic holiness lived in and for Christ’s Church and so the O Lumen leads us to contemplate the virtues that united Dominic to Christ. Certainly each phrase of the O Lumen reminds us of the virtues that will make us greater witnesses to the Gospel. But there is a point where the text and music combine to remind us most powerfully of our heritage, at the longest sequence of notes in this chant, the word “veritatis” falls into place. Veritas, Truth, is a motto of our Order. This is the Truth we preach each day, the Truth who gives life to the Church, the Truth who is the joy of the blessed. This Truth is Christ, our Way and our Life. And so as we pray the O Lumen, we pray that we might give ourselves totally to the Truth in order that we might continue to walk with St. Dominic along the Way of Christ. Listen to our sisters chant the O Lumen.